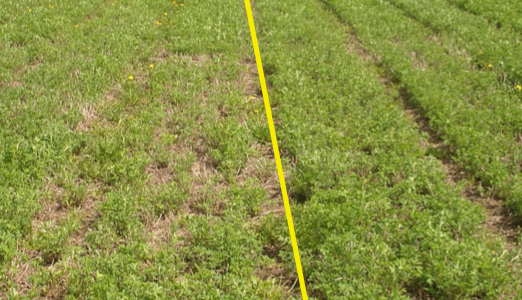 This assessment can begin as soon as the frost is out of the ground and continue until spring greenup occurs. 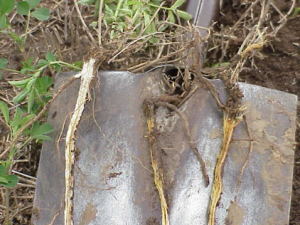 The process is to dig a few plants 4 to 6 inches deep and look at the condition of the taproot. If the taproot is turgid (like a potato, leftmost plant), it is alive and healthy. If the root is browned, dehydrated, and ropey (like two plants on the right), it is dead or dying. This assessment can be repeated until greenup occurs and stand can be assessed on that basis. Alfalfa forms buds in the fall for spring growth. 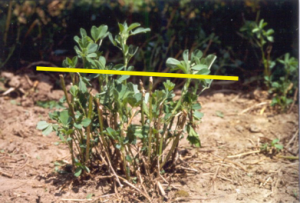 If these buds are killed the plant must form new buds in the spring, delaying growth and reducing yield.The three taller stems in the picture (above line) are from buds formed in the fall and the shorter stems are from buds formed in the spring. The delayed, shorter growth will reduce yield of first cutting and then plants will recover. If you see this, consider management to reduce this in the future, such as adequate soil pH, fall application of potassium, more winter-hardy varieties. Are there thin spots in the field? A healthy stand should have 55 stems/ft2. Early assessments, before stems are visible, may need to assess based on plant count. A high yielding alfalfa stand seeded last year should have 20 plants/ft2, counts as low as 12 will produce good yield but result in shortened stand life. Stands, seeded last spring or fall with less than 12 plants/ft2 should be disked and reseeded.